Yes, death is a part of life and that fact does not make it any easier. A sobering 'pause moment' this Sunday was to place sixteen separate floral bouquets at Babyland in the cemetery after church today. The idea to visit Babyland and place flowers on the graves, occurred to us after we sat graveside singing hymns to mom from today's church service. The pews at church had been brightly decorated with white hydrangeas and ivory satin bows and ribbons (left from a wedding the previous evening). After today's church service, I learned that the pew bows were going to be thrown away and I asked if I could take them. I gathered the pew bows and carried them with me to the car. As Dan drove, I sat and removed the extra ribbon from each bouquet to use on future wedding accessories and we set off to the cemetery with the intention of placing the flowers on mom's grave. 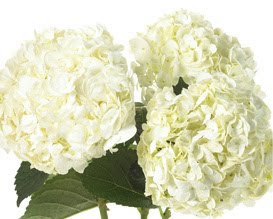 I tied four bunches of the white hydrangeas with one of the ivory satin pew bows and placed it on the grave marker as we sang to mom in heaven. I then looked at Dan and said, "we should leave flowers on Stephanie's grave." [I was referring to the isolated grave at the curb that I discovered once when we walked from the parked car on a visit to the cemetary to talk to mama.] 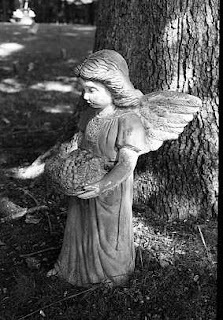 Stephanie's grave always looked so forlorn, never a flower adorned it and I often wondered if anyone ever came to visit the grave of this little girl who lost her life when she was 8 years old. As we placed a bouquet on her marker and said a prayer, Dan suggested that we visit Babyland and distribute the remaining bouquets. We thought it would be nice to place the beautiful bouquets on unadorned graves in the children's cemetery. As we parked at the entrance to the baby cemetery, I noticed a lonesome grave across the path on the other side. As we approached we saw a beautiful bronze marker that showed the picture of a handsome teenage boy. The grave was adorned with a statue of an angel and a cross. This young man had lost his life at 15 years of age. His bronze grave marker polished clean and well cared for in this serene spot among the dappled trees. We placed a bouquet of flowers on his grave and said a prayer. 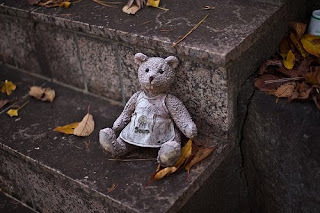 We then walked across the path to the entrance of Babyland, and as I approached the outer circle I gasped at the overwhelming number of tiny grave markers before me fanning out in a circle. 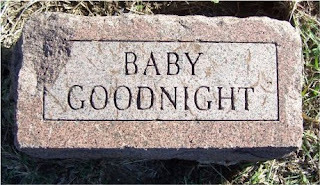 I stood in hushed silence and read "baby boy" who died on the day he was born. Another, was a brother and sister buried side by side, a few years apart in age, but they died the same day. Dan and I wished we had more flowers than what we had, as we walked around placing flowers on the tiny graves that had no decorations. As I placed the last bouquet, I walked away from the tiny graves and away from my husband, fighting tears and feeling quite humbled by the experience. Yes, they are gone, but not forgotten. Taking the time to visit that quiet place today was a solemn 'pause moment' for me. Life IS indeed precious.